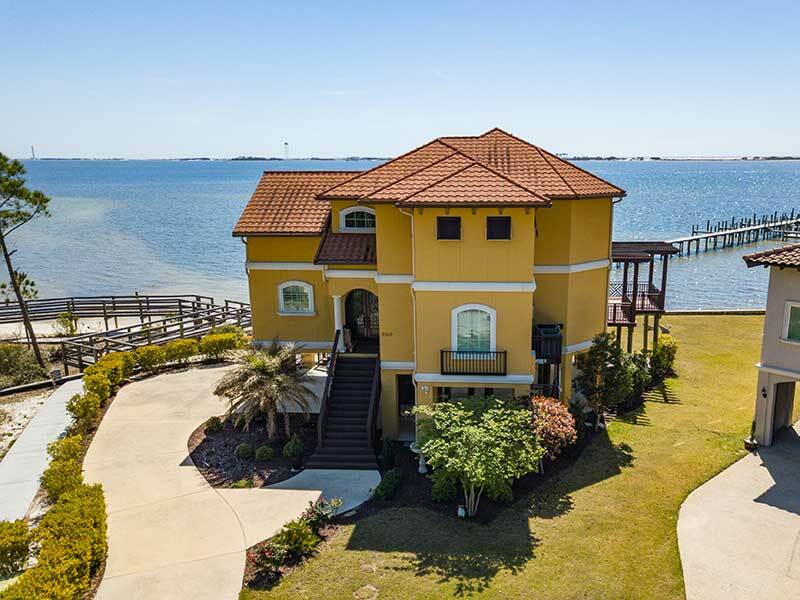 This custom-built luxury residence, constructed in 2012 and featuring Mediterranean-inspired architecture, welcomes you home directly on the waterfront of Okaloosa Sound in Navarre. With endless views of the Gulf of Mexico, you will be thoughtfully positioned within an exclusive enclave neighborhood directly south of Highway 98 in Navarre. The home comprises four bedrooms, three full bathrooms, more than two floors of exquisite living space, designed with an elevator shaft and a parking space underneath on the ground level. In close proximity to the beautiful beaches of Navarre and Pensacola to the west with Fort Walton Beach, Destin and the beaches of South Walton/30A to the East. Features: Custom-built waterfront luxury residence; Mediterranean-inspired architecture; stunning spiral staircase in foyer; exceptional entertaining spaces inside and out maximizing the waterfront views; gourmet kitchen featuring custom cabinetry, granite and high-end stainless appliances; master bedroom retreat with private balcony directly on the water; high ceilings throughout with floor-to-ceiling windows; expansive views over the intracoastal waterway of Okaloosa Sound and the Gulf of Mexico; deeded boat slip on the private community dock maintained by homeowners association.